Manufacturer Description MONKEY MAYHEM LIVES ON! Kiddy Kong is a portly primate toddler with incredible power and agility! He teams up with Dixie Kong to stop the ever present army of Kremlings. The game play and ACM graphics just keep getting better in this visually stunning installment in one of the most popular video game series of all time. 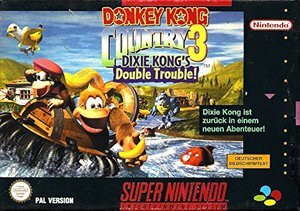 Combining their unique abilities as they each other into action Dixie Kong and Kiddy Kong set off to rescue Diddy Kong and Donkey Kong. Collect tons of treasures grab billions of bananas and find more stuff than you've ever seen (or not seen) as you set off on the greatest DKC adventure yet! The final showdown with KAOS takes place in a cliff-top laboratory at the End of the World. It could get seriously ugly. Monkey mayhem lives on in this exotic island adventure!